9 earthen pot again, boil the syrup till it thickens a little, & pour it hot over them. 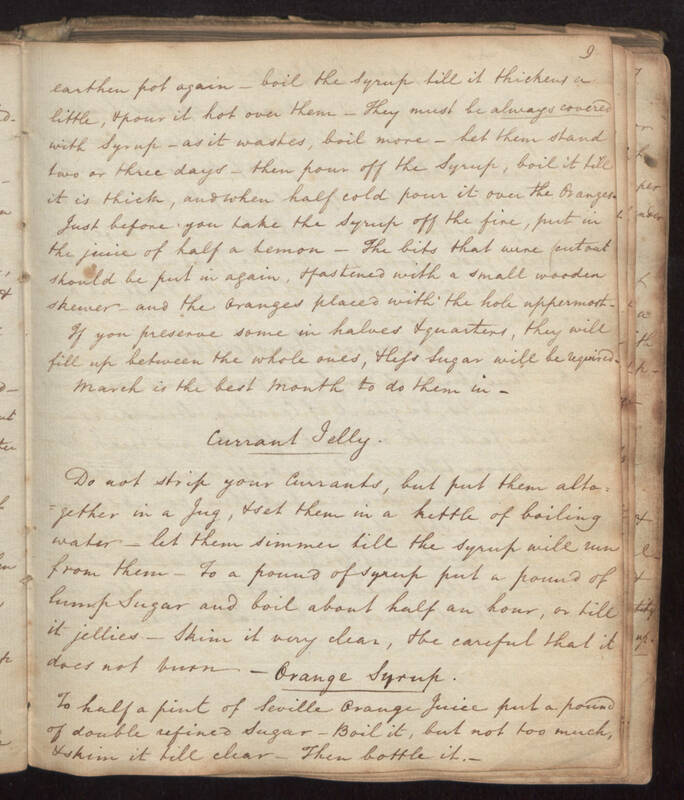 They must be always covered with Syrup, as it wastes, boil more, let then stand two or three days, then pour off the Syrup, boil it till it is thick, and when half cold pour it over the Oranges. Just before you take the Syrup off the fire, put in the juice of half a lemon. The bits that were cut out should be put in again, & fastened with a small wooden skewer, and the oranges placeds with the hole uppermost. If you preserve some in halves & quarters, they will fill up between the whole ones, & less Sugar will be required. March is the best Month to do them in. Currant Jelly Do not strip your Currants, but put them altogether in a Jug, & set them in a kettle of boiling water, let them simmer till the syrup will run from them. To a pound of syrup put a pound of lump Sugar and boil about half an hour, or till it jellies. Skim it very clear, & be careful that it does not burn. Orange Syrup To half a pint of Seville Orange Juice put a pound of double refined Sugar. Boil it, but not too much, & skim it till clear. Then bottle it.